As the body ages, it becomes less capable generating the same volume of essential amino acids that keep it at prime health – the slowed production of essential acids, combined with free radical damage from all kinds of sources, are majorly responsible for the symptoms that make a person appear and feel “aged”. Collagen is the most common and essential protein in the body, and it is a very powerful agent for preserving your vital body tissue’s integrity against the flow of time. The following products have been found to be some of the most reliable and powerful of facilitators of anti-aging benefits through collagen supplementation. Neocell Super Collagen+C Type 1 and 3 delivers collagen in the form of gluten-free, non-GMO tablets. Six tablets taken together collectively constitute one complete serving with 6,000 milligrams of hydrolyzed super collagen 1 &3. Each individual container holds 42 tablets, and each individual tablet contains 22 calories. In addition to the collagen content, the tablets also contain 30 milligrams of sodium and 60 milligrams of calcium ascorbate. Customers are advised to take note of the fact that the tablets may contain trace amounts of naturally-occurring sulfite residue. Neocell Super Collagen+C is mainly billed as a cosmetic supplement that could potentially aid the user in regaining a mother youthful appearance through collagen restoration. If the cosmetic effects manifest, then user may experience slight thickening of their finer hairs and firmer skin. The supplement can also be used for supplementing the bone matrix by fortifying their mechanical strength. In addition to increasing the overall resilience of bone matter, the supplement is also made to facilitate an accelerated healing rate for damaged nail beds. While supporting to the bones, Neocell Super Collagen+C is also intended to provide other benefits on a molecular level. Clinical studies have demonstrated that consistent collagen supplementation might potentially be correlated with restorative action on connective tissues and a higher capacity for elasticity. Collagen supplementation may also slightly engorge the blood vessels, which can be highly beneficial for blood circulation. Research has demonstrated that type 1 and 3 collagen peptides carry the ability to deliver significant collagen content to tendons, ligaments, and lean muscle. Out of all of the connective tissue found within the average human body’s fat content, 90% of it is composed of Collagen Type 1 & 3. 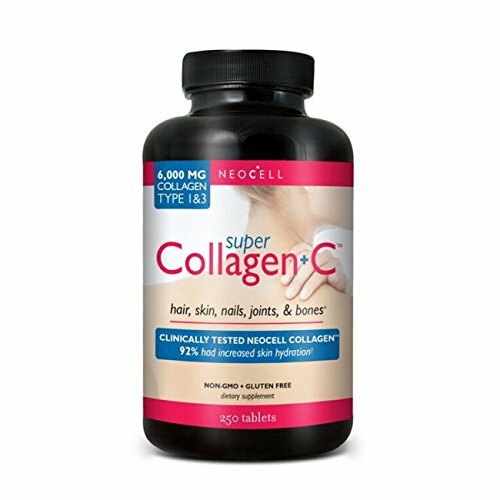 Neocell Super Collagen+C contains a high degree of hydroxyproline and hydroxylsine. Hydroxyproline and hydroxysine are both essential amino acids, and the only way to get either of them is by supplementing collagen. By taking consistent doses of Super Collagen, customers will not only give their bodies a steady supply of Collagen Type 1 and 3 to all of the places where they need them, but they’ll also have more natural collagen availability. Neocell Super Collagen+C doesn’t just provide a temporary spike in collagen levels, but also works by activating messengers for the synthesis of brand new collagen fibers. New collagen fiber synthesis is made possible due to peptide production. Peptides are produced through the sudden surge of Neocell Super Collagen, and through this peptide production, fibroblast cells for new fiber synthesis are stimulated. This collagen supplement’s primary source is food grade bovine collagen. The food grade bovine collagen content making up Neocell Super Collagen is derived from the dermal layer.When Neocell Super Collagen gets to work within the body, it immediately goes into a process of enzymatic hydrolyzing. The primary advantage prevented by the way that Neocell Super Collagen+C gets enzymatically hydrolyzed is its amino acid ration. The amino acid ration provided by Neocell Super Collagen is a relatively lightweight reproduction of the body’s natural collagen reservoir, and because of this, it’s highly bioavailable when ingested. Neocell Super Collagen+C’s ability to work so seamlessly in the body comes from the fact that its amino acid supply is practically a scale-model of the exact amino acid supply that’s naturally found in our own body’s collagen. The optimized bioavailability allows up to 90% of the content to be absorbed directly into the blood stream. As soon as the blood stream has been charged with the essential amino acids, changes begin to happen on a cellular level. Customers are advised to split up their 6000 mg serving of Neocell Super Collagen+C between two oral half-servings made up of three individual tablets, once in morning and once in the evening. There are approximately 19 different amino acids making up the Neocell Super Collagen+C formula. Within the supplement’s amino acid blend, glycine, proline, and alanine are all included. 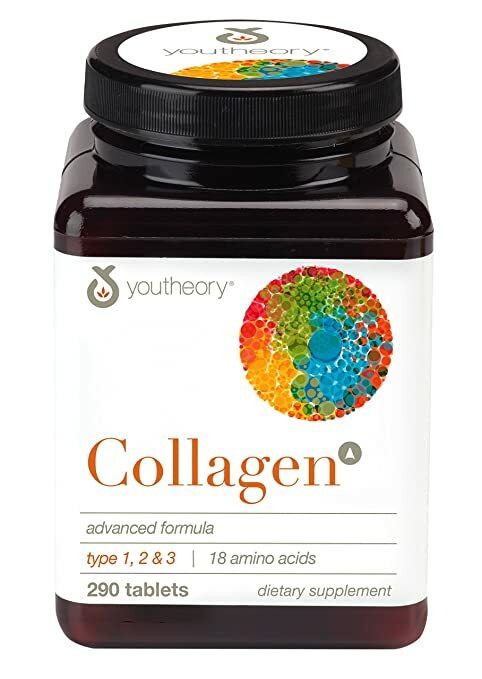 Youtheory Collagen Advanced Formula 1, 2 and 3 is made with non-gluten tablets. One serving of Youtheory is made up of 6 tablets that each contain a complete gram of collagen, collectively making up a 6000 milligram dosage. Every container of Youtheory contains 288 tablets altogether, collectively forming exactly 48 servings. In addition to the collagen content, Youtheory also holds 10 milligrams of sodium and 60 milligrams of Vitamin C. The fusion of Collagen Types 1, 2 and 3 within the product’s formula creates a full protein. Collagen Type 1 and 3 are the primary forms of collagen in the body’s connective tissue , and Collagen Type 2 is supplemented to assist in lubricating the joins with extra cushion. Ideally, the combination of Collagen Type 2 with Collagen Type 1 and 3 would facilitate an accelerated rate of healing in the user’s complexion, hair, skin and nails. Youtheory is specifically billed as a collagen supplement that, while hopefully providing the intended cosmetic benefits, might also be a viable form of defense against ligament deterioration. Aging athletes have the greatest risk of being abruptly incapacitated by sudden joint injuries, and so they might be among the demographics with the most potential value to be gained out of Youtheory supplementation. Every ligament and tendon is already undergoing strain from bodyweight and daily exertion alone, and when combined with strenuous physical activity, the need for additional joint safety becomes all the more imperative. The collagen making up Youtheory tablets is derived from hydrolyzed bovine and hydrolyzed chicken. In addition to the hydrolyzed ingredients, there is also an unspecified amount of magnesium stearate. Customers have testified that positive effects from the supplement have generally manifested over the period of several months of consistent use. One of the more commonly reported effects is a gradual fading of some of the more prominent lines that develop on the face with aging. Some customers have reported that they took only half of the recommended daily dose of 6,000 milligrams, but even at their lower level of intake, they were still able to see subtle cosmetic benefits. Some customers reported that one of the benefits gained from regularly taking Youtheory was a gradual rate of nail thickening. Using the collagen supplement was also particularly helpful to a customer who had, in their younger years, put their knees through a great deal of stress. The customer had begun to take supplements to keep their knees lubricated since age 28, and without a steady glucosamine dosage, the pain was significant and constant. After taking Youtheory for two weeks, the customer testified that they felt the first consistent relief that they’d had since taking medicine for joint support. Since taking Youtheory, the customer no longer has to rely on glucosamine supplementation to feel as though their knees are functional. The nail and hair growth was more than they expected, but this didn’t outweigh the benefits to their connective tissues. Activa Naturals Hydrolyzed Collagen Type 2 delivers collagen in the form of vegetarian capsules. There are 120 vegetarian capsules in each container, and two capsules constitutes an individual serving, adding up to exactly servings in each container. Customers are advised to take one 2-capsule serving on a daily basis, preferably with food. Each serving of Activa Naturals Collagen individually contains 350 milligrams of Collagen Type 2. In addition to Collagen Type 2, each one of the capsules also contains 350 milligrams of protein, 220 milligrams of chondroitin sulfate, and 80 milligrams of hyaluronic acid. The capsules do not contain any chemicals, fillers, or artificial additives. The supplement remains fresh for approximately 2 years, which should allow customers ample time to finish a container long before expiration. The grand sum of each of the ingredient in an Activa Naturals Collagen serving adds up to 1000 total milligrams, and these ingredients are collectively referred to as the Collagen Hydro Fix. The product is meant to provide its benefits through a synergistic combo of chondroitin sulfate and hyaluronic acid. 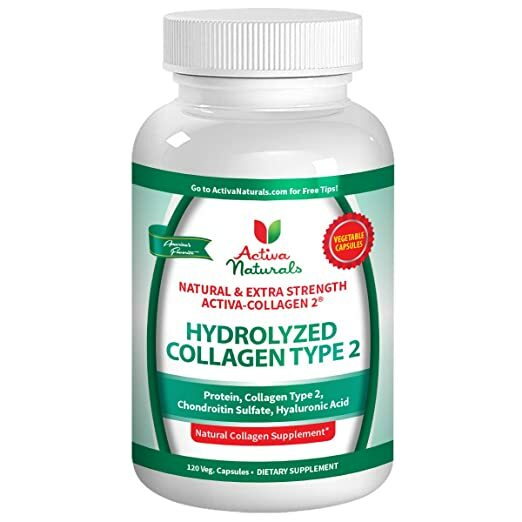 As a Collagen Type 2 supplement, Activa Naturals Collagen supplements ingredients that are particularly beneficial to articular & hyaline cartilage. With Collagen Type 2 supplementation on a regular basis, some users might be able to experience significant relief to any persistent joint pain that they might be experiencing. Like all forms of collagen supplementation, users might also be able to achieve notable benefits to their complexion. Activa Naturals Collagen, overall, is billed as a free radical scavenger and antioxidant. By combating free radicals, it serves as a defense force against many toxic agents that could serve to make the body deteriorate with age. Some owners testify that consistent Type 2 collagen supplementation has protected them from the damage that they would usually experience from being regularly exposed to sunlight. The blend of targeted vitamins and hyaluronic acid in the Activa Naturals formula provide the potential for several unique benefits aside from join lubrication, including protein supplementation, joint elasticity, eye health, and arthritic relief. With increase capacity for joint elasticity could very well promote more enthusiasm for users to get “in the zone” for exercise. One customer testified that Activa Naturals Collagen was very helpful for her 70-year old father in more ways than one. After taking a daily serving of the capsules for 3 weeks, she noticed that her grandfather’s skin has tightened up very nicely. Her grandfather felt more energy and gained total relief from his knee pain without any side effects. Another customer testified that taking Activa Naturals collagen stopped them from having any breakouts during the month that they took the supplement. After having to deal with ritual monthly breakouts, they decided to begin taking a nightly serving Activa Naturals Collagen before bed.While the noted that the tablets were a bit larger than she had originally anticipated and had a slight aftertaste, the benefits more than made up for it. Neocell Super Powder Collagen, like its heavier-fortified “+C” cousin, is made gluten-free. Instead of delivering supplementary collagen through tablets, this product is entirely powderized. A singe scoop of the powder contains 6,600 milligrams of hydrolyzed super collagen 1 & 3, roughly equivalent to what one might expect from a tablet-based collagen supplement serving. The standard 7 oz container of Neocell Super Powder contains 30 servings altogether, and customers are advised to take just one scoop daily to meet their supplementary needs. Collagen Type 1 & 3 is the sole ingredient contained in Neocell Super Powder, without any fat or carbohydrates. 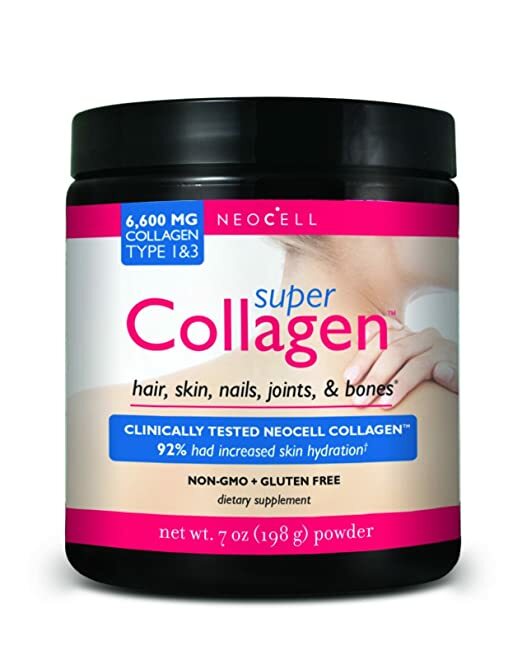 Just as the other options for collagen supplementation do, Neocell Super Powder is meant to be used as a way to provide additional mechanical strength to the user’s bone matrix. By providing more strength to the bone matrix, users can have extra resilience during their regular exercise sessions in the long term. Neocell Super Powder can also be used for improving nail density and thickening the sections of hair that may be thinning out with age. Neocell Super Powder, on a molecular level, operates by taking direct action on the user’s connective tissues. When the connective tissues have a proper degree of elasticity, a healthier overall blood flow is made possible. Another positive potential effect from taking collagen powder regularly is the potential aid it presents to wound healing, skin firmness, and hydration. As this product is delivered in powder form, it can be successfully taken with water. Either warm water or cold water are perfectly fine options for mixing the powder in before drinking. Some customers also choose to mix the supplement in with various juices or other supplies of hyaluronic acid. Any customers who are against animal-based products should be advised that the product is synthesizes from food grade bovine collagen. One customer testified that stacking the supplement with various other forms of targeted vitamin ingredients helped to increase the efficacy of the collagen itself. In addition to the collagen content in their morning dose, the customer also made a point to take the supplement alongside Vitamin C. The additional dose of Vitamin C, the customer reported, helped to potentiate the collagen.. The customer also decided to take the collagen and Vitamin C along 6,000 milligrams of hyaluronic acid, which they stated was highly useful for keeping their bones, ligaments and skin consistently well-maintained. Another customer testified that prior to taking Neocell Super Powder, she had suffered a serious elbow injury. Despite trying multiple remedies, the pain was persistent and she couldn’t find enough relief to even pour a cup of tea. After discovering Neocell Super Powder and taking it only three times a day, she was pleased to discover that the pain gradually all but disappeared. In the six weeks that she spent taking the supplement, she also noticed that her nails had grown longer and more durable. The primary goal that most people decide to invest in collagen for is to fight off symptoms of premature aging. Collagen could technically be considered a form of molecular adhesive, or a “glue”, that holds the body together to keep it from deteriorating with age. Every component of the body starts to break down over the years, but because each of those components is made up of collagen, supplementing with collagen benefits everything across the board. It would be wise to consult your primary health care provider in advance to check for any possible hidden conditions that may be contributing to tissue degeneration, aside from simply aging; this will allow you to more accurately gauge the effectiveness of the supplement itself. One key thing that may intrigue some users is the particular difference between Collagen Type 1 & 3 and Collagen type 2. While Collagen Type 1 & 3 contains a blend with 19 amino acids, Collagen Type 2 only contains 18 amino acids. There are some who suggest that Collagen Type 1 & 3 and Collagen Type 2 should not be combined, as it could potentially lower the total bioavailability. If Collagen Type 1 & 3 and Collagen Type 2 are combined, then an issue may arise from the interaction between the two proteins. In the event that Collagen Type 1 & 3 and Collagen Type 2 proteins interact, then a complete protein will be created. When a complete protein is created, the body may not be able to immediately recognize it as a collagen. Though Collagen Type 1 and 3 can be and often are combined with Type 2, it pays to be aware of how your body uniquely reacts to the combination. Nearly all customers who used collagen consistently for at least 4 weeks noted that their hair and nails were directly affected by their supplement. While some people are directly aiming to thicken their nails and accelerate their hair growth, people who don’t desire either of those effects should be aware of the fact that it’s a constant possibility. Before committing to a collagen supplement, it may be prudent to take note of just how the recommended dosage can be divided. Some customers have reported adequate effectiveness at only half-strength doses, which means that if you’re worried about excessive nail or hair growth, you might be able to manage it by taking a halved dose that still provides adequate benefits overall. Collagen has been shown as particularly helpful for people who are involved in highly active daily activity, but naturally, this can go in ether direction. If you suffer from joint pain that prevents you from performing at maximum capacity, then naturally, you’re going to be able to go closer to 100% with connective tissue aid. On the other hand, overexerting yourself might prevent the collagen from being capable of reducing as much pain as it should. Collagen won’t completely remove the risk of tendon or ligament tears from stress, but customers should be careful not to let the potential benefits make them overconfident. The best possible effect of collagen supplementation will be gained if it is accompanied with other healthy dietary habits. Targeted nutrients like Vitamin C can potentially facilitate even greater degrees of the effects that collagen can have, but it would take several weeks of consistent supplementation. In order to facilitate a healthy complexion, you will naturally have to ensure that your other habits don’t directly counteract the cosmetic benefits. Customers who reported a successful experience with collagen also tended to have diets free of processed foods and greasy snacks. Taking a daily multivitamin alongside collagen supplements would be ideal. Collagen supplementation can restore thinning hair, strengthen nails, and slow down the degenerative process of just about all of the connective tissue in your body. Customers report that collagen supplements often provide level of relief that couldn’t be gained from conventional or homeopathic medicines. Collagen’s alleviation of joint pain, along with its tendency to increase tissue elasticity, may make users feel more motivated to exercise with heightened intensity. While the potential is great, the best possible results from collagen supplements will be gained if the supplements are taken alongside healthy choices and a reasonably active lifestyle.